Hey everyone. This is my 1982 El Camino. I bought it back in 2016 when I was still 16 years old. I've always had a thing for el caminos since I was younger. When I picked her up she had a 305 HO out of a Z28 camaro, a th350 and a 10 bolt. It was in questionable condition when we first brought it home but I couldnt be happier! But first a couple notes: I am new to posting to forums so not sure if there is a way to alter the size of images, I like pics in threads so I will be posting a lot, I am doing some cool stuff so I will try to explain everything that I had trouble figuring due to a lack of info on the internet, and if you have a question please ask! The motor had a pretty load tic and after my dad and I tried to fix it and what not I think we ended up making things worse. The tic turned into a quiet knock so we pulled the motor. The crank was shot and there was no way I could run it as is. So one day my dad surprised me by buying me a goodwrench crate 350. It was a bare bones 250hp/350trq sbc. So the crate came and a short time later the new motor went into the car. So at this point I had replaced all the bushings, tie rods ends, and brake components in the front end of the car to make sure it was 'road worthy'. So here I am still rockin the th350 and the 10 bolt. With living at home and being around 17 my dad set a few rules for the car. A major one was since the el co didnt come with an airbag I had to have harnesses. So me and my brother went about fabbin a harness bar to go off the seatbelt mounts. So the harness bar bolts to the seat belt mounts and bolts to the body right behind the middle seat on the bench. The bar sits super flush under the molding . After paint it blends right in. Tied into the seat belt mount. Some simple 4 point harnesses. After all this work we did some burnouts and I drove it occasionally around town for about 2 months. This pic is from Thanksgiving 2017. Then in January 2018 the th350 gave out on me. On the way to campus the transmission blew all the fluid out and it had to be trailered home. Not sure what the problem was, but would not retain fluid any more. So for me I eventually wanted to go with deeper axle gears so a 700r4 was on the shopping list. I went to a salvage yard and pulled a solid 700r4 MD8 K case (if I remember right that means its the strongest 700r4 put in trucks ). I went through it and replaced all the seals and made sure it was in good condition. But at the same time my brother told me 'hey man you are going to have to shorten the driveshaft for the new transmission but if you did the axle swap you might have to have it shortened again so why not do it at the same time?' 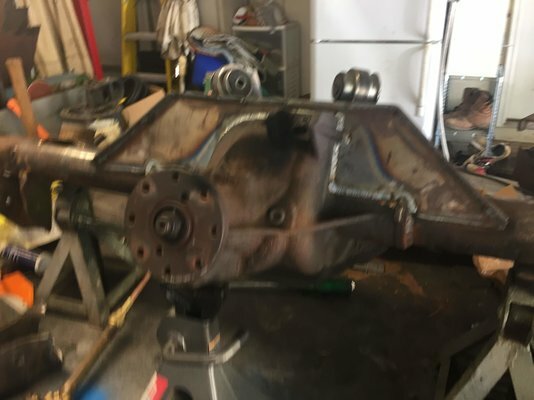 I havent mentioned this yet but the axle that I was planning on putting in was an explorer 8.8 with lsd and 4.10s. Yes I know its pretty rad . So I thought what the hell lets do it. That was one year ago. The first thing to tackle was the cross member. The stock cross member would not work with the 700r4 because of where the speedo censor was located in the transmission. 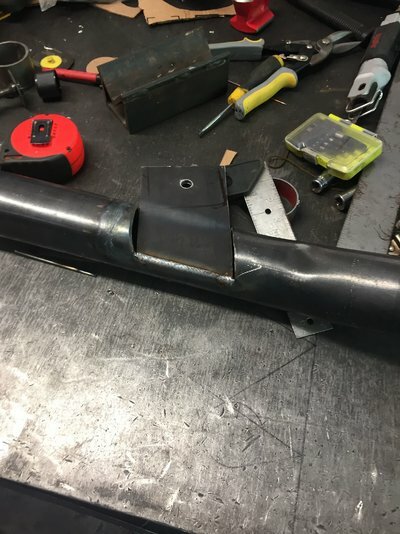 I cut a notch in the cross member and put a plate down and welded it in with a couple gussets and drilled the hole for the trans mount. Im pretty sure this was the only major thing that had to be changed for the 700r4. Next up was the axle. Oh boy. First things first you have to shorten one axle tube because one side is longer than the other in explorers. You cut down one side so you can use two short side shifts. My dad had a buddy of his do weld the axle tube after I cut it. I cut the brackets off the 10 bolt and off the 8.8. My plan was to weld the old brackets onto the 8.8 and it actually worked ok. Since the explorer 8.8 was originally leaf sprung I needed to handle the upper control arm situation. I made a truss for the axle that my brother said could be for a rock bouncer . I had to shave the top of the diff to get truss to lay flush on the top of the diff. I fully sealed the truss to the diff by fitting some plates to the side and pre heating and post heating the diff since it is cast iron. Because of the truss I also had to shave the diff cover a little bit at the top (but I accidentally shaved the bottom the first time not paying attention). It took a long time to get the 10 bolt brackets on the 8.8 all squared up. The only other thing left to do was drill the new bolt pattern in the 8.8 shafts. I came up with a pretty same and smooth method for getting it done that I had not seen anyone else do. I cut a hole in a plank of wood just big enough for the axle shaft to sit flush and then I strapped the plank to the drill press and made wuick work of the axle shafts. The best method for getting the bolt pattern right was to use the brake drum off the 10 bolt and use misalignment punches to mark the holes. Then I pushed in the studs from the 10 bolt shafts and called it good. And major plus the 14s fit over the 8.8 brakes!!!!! not sure if they would but they do. So two things happened that I had not seen coming. The first was that the shocks could not bolt up to the lower control arm mounts because they hit the new brake calipers. I dont know if you can tell from the photo but the shock is mounted at the top but will not swing out far enough to reach the mount. So I made some new mounts. Its good a weld washer and some gussets going on in there so I think itll work just fine. The other unforeseen problem was that the 8.8 brake line would not match up with the hard line in the car. I didnt think about it until I actually saw it in front of me but after some googling I got the correct fitting (weatherhead 7828), a union and some extra brake line (about 10 in I think) I bent it up and went pretty smoothly. After some other odds and ends we ended up where I am today. The car has been sitting for one year and in the morning I should be firing it up and hopefully it all works as it should. Nice car - nicer Dad ! Apparently taught you a lot, Nice fab and welding !! Not bad for a young pup. Your dad is a good man to teach you the needed skills. I wish when I was your age I could of done half of what you did. Hey, Welcome from West Michigan. Thanks everyone for checking out the thread. And I most definitely appreciate all the help from my dad. Me and my twin brother have been messing with cars since we were knee high to a grasshopper. My brother has done a lot of custom stuff with his Suzuki samurai since he got when he was 11 y/o and I've had a jeep Cherokee that I've fooled around with since I was 14. My family has always been an offroading family so its pretty cool having the first 'street car'. I drove the car today! just around the neighborhood but it was flippin awesome! But I have an issue. The transmission will not shift into 3rd or 4th. Not entire sure what the problem might be but if anyone has some suggestions that would be great thanks. Ive adjusted the tv cable but ive read it might be the clutch pack but really hoping its not .